PJs (or Program Jockeys to the uninformed) began to appear on YTV in 1991, helping to fill out precious time between programs where advertising could not be sold, and to bolster the Canadian content quota mandated by the CRTC. It didn't take long for the first crop of PJs like Jazzy Jan (Janis Mackey Frayer) and Gord the PJ Man (Gordon Woolvet) to catch on and develop cult followings, but it was the fortuitous arrival of one Phil Guerrero aka PJ Phresh Phil that triggered a seismic shift in YTV's image, vibe, and street credibility. 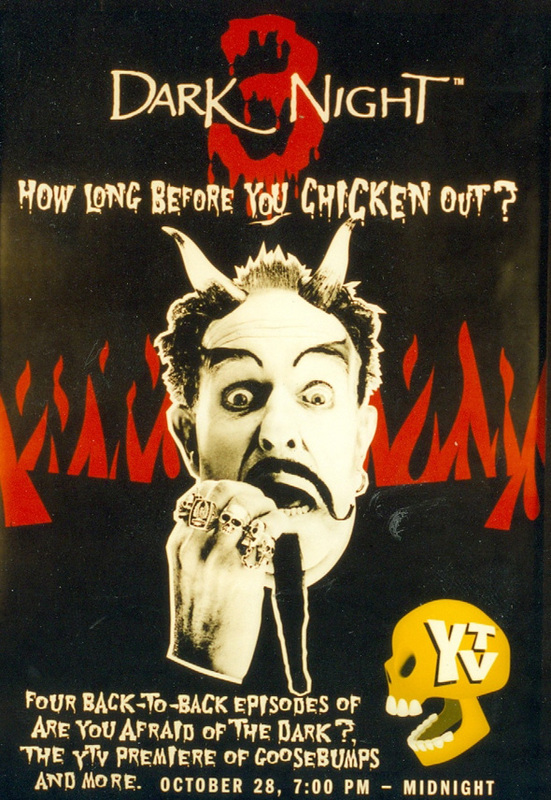 When YTV launched in 1988 they billed themselves as "the spirit of youth"; now they had a Reverend to preach it. By 1993 the PJs were the face of YTV, and after great success with 1992 Canada's Wonderland set Festival of Friends, PJ fronted specials outside of program blocks like The Zone and the Alley began happening with greater frequency. And what better event to build a special night around than one that marketing had determined was key to kids - Halloween. The very first Dark Night premiered in October of 1993, a skin-crawling twenty years ago. In October of 1995, YTV's atomic creative explosion knew no bounds and the production of Dark Night 3 kicked the enterprise up several notches by shooting at Casa Loma, bringing a real sense of scale to the nominally low key PJ special events. Paul McGuire aka PJ Paul remembers "Dark Night was a big deal at the time. We were used to the small Zone studio and working with nothing, now we've got multiple crews, lightning rigs and dollies". Dark Night 4 found PJs Phil and Paul wandering around the fog shrouded Toronto streets, looking for a Halloween party while Phil struggles with the fact he has become uncool while Paul's arm has been bitten by a creature and he may be turning into a monster. In those days, YTV HQ was located at 64 Jefferson Avenue (ironically now home to Moses Znaimer's silver foxy Zoomer empire), and the surrounding area afforded suitably creepy locations for the Dark Night shoots. "I remember getting home at like 7am in the morning, after shooting all night around YTV in the warehouses there. Before it became Liberty Village, it used to be a landfill, with abandoned buildings and warehouses. It was crazy" recalls Phil Guerrero. "You gotta remember, back then it wasn't called Liberty Village, it was Lower East Parkdale. When we were shooting (Dark Night 4), in the park there were vagrants, needles and condoms scattered around on the ground, you know? It was a totally different place" adds McGuire, who fondly remembers a zealous make-up artist applying mini-sardines from a tin to create the wound effect on his arm. As the plots of Dark Night became more inspired, so did the merchandising and promotional tie-ins which became a huge part of the Dark Night experience: from YTV branded bowling ball bags for severed heads, to watches with disappearing YTV skull icon to an actual Dark Night board game. Hasbro Canada provided mind-blowingly massive prize packs rewarding eagle eyed viewers who participated in 1-800 trivia contests. One year the response was so overwhelming the jammed phone lines eventually took down New Brunswick's network, underlining the furious passion surrounding Dark Night. Dark Night 5 in 1997 was perhaps the apex of them all, prophetically pre-figuring the reality TV/faux horror craze which wouldn't kick off until 1999 with The Blair Witch Project and the rise of the "found footage" genre. The PJs held fort at YTV's control room while monitoring supernatural events unfolding in a small (fictional) town called Tweed. It was as if X-Files had hijacked the Zone and transported it into the heart of Twin Peaks. Was it perhaps too much for kids to see their trusted daily hosts placed into such otherworldly peril? "There was a lot of controversy back then - if it wasn't kids gambling with Pogs, the horror stuff was too much for them, or the Power Rangers were making kids beat each other up in the school yards. Every time we did a Dark Night we wondered if it was too scary" recalls Guerrero. Things were certainly reigned in for the following year's Dark Night, which was not numbered and featured a monstrous game show parody from the production team behind YTV's smash UH-OH. 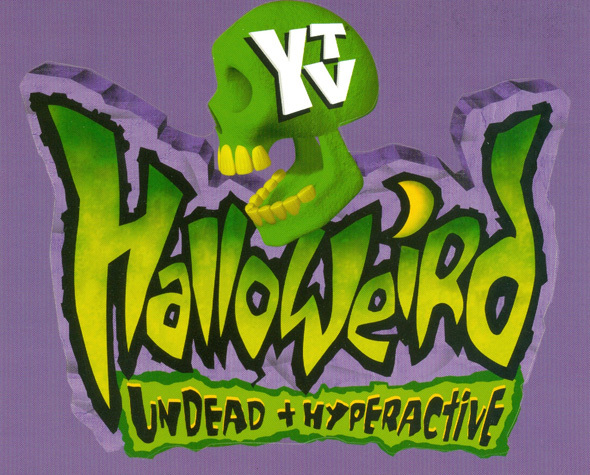 In 1999, Dark Night was replaced by Halloweird, and by then both Phil and Paul had moved on from YTV. The winds of change were blowing, and those innovative and anarchic madcap '90s YTV stylings were soon a thing of the past. Last week, home girl Ellen Page tweeted "Halloween approaching makes me remember the limitless, undying joy that YTV's Dark Night gave me. Any Canadians in the house hearin me?" illustrating the legacy of Dark Night which lives on in the hearts and minds of '90s kids who came of age during that innocent time before the internet irreversibly changed everything, even how we celebrate Halloween. "That was the '90s for you..." Guerrero thoughtfully explains with a sly hint of PJ Phresh Phil sneaking back into his patois. "Great time to be a kid, lame time to be an adult".